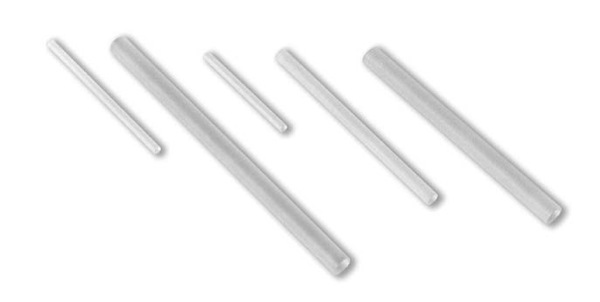 Nd: Yag Rods: Directed Light Inc.
Neodymium doped Yttrium Aluminum Garnet (Nd:YAG) is the most commonly employed solid state lasing medium for material processing applications. Nd:YAG has relatively good optical absorption and conversion efficiency, low lasing threshold and good thermal dissipation for high power operation. Electrons in any given atom can occupy various discrete energy levels associated with discrete orbits or “shells” around the atomic nucleus. Electrons in higher orbits possess greater energy values than electrons in lower orbits. Without the addition of outside energy, electrons will tend to settle to the lowest orbits and energy levels available. However, if energy is added to an electron, it can be boosted to a higher level, leaving a vacancy in the lower level. If enough electrons are boosted into higher energy levels, a condition known as “popula- tion inversion” can be created. A population inversion exists when a high energy level is more populated than a level below it (see figure above). This condition is a prerequisite for lasing to occur. In fact, the minimum population inversion required to initiate lasing is called the “laser threshold.” Lasing occurs when electrons fall from a high energy level to a less populated level below, releasing their stored energy in the form of photons of coherent, monochromatic, laser radiation. 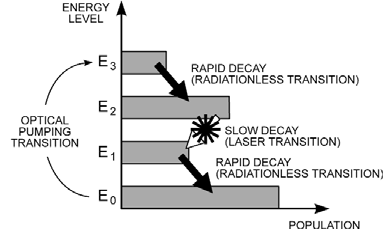 Neodymium (Nd) is the active laser medium in an Nd:YAG laser system. It is an excellent laser medium because it responds well to optical pumping and reaches laser threshold relatively easily. Its threshold is low because it achieves population inversion via a 4-level pumping scheme (see illustration below). If light from a Xenon or Krypton lamp is reflected into the Nd:YAG rod, some of it will be of the proper energy and wavelength to be absorbed by the Nd atoms, exciting some electrons from the ground state (EO) to the highest energy level (E3). This is called optical pumping. Four level optical pumping has two important benefits: easily maintained population inversion and good pump transition absorption. For a pump transition to remain highly absorptive, the ground state must be highly populated relative to the upper state of the transition. In 4-level pumping, the rapid (short lifetime) decay from E3 to E2 builds the E2 population quickly for good inversion, and keeps the E3 level relatively empty and ready to accept more electrons. This keeps the E0 to E3 pump transition very absorptive, hence very efficient. Secondly, the rapid decay from E1 to E0 keeps the E1 level at low population for good inversion and rapidly replenishes the E0 ground state for highly absorptive pumping. 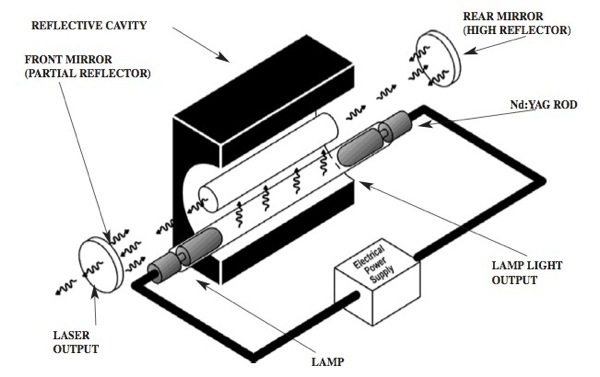 For efficient optical coupling, the rod and pump-lamp are usually positioned close to each other inside a reflective housing. 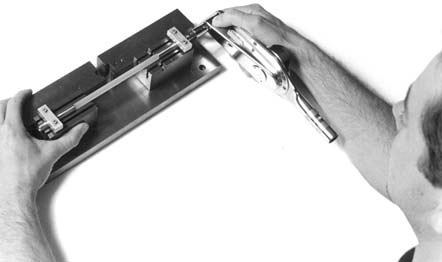 For low power applications, such as marking or resistor trimming, the rod can be continuously pumped by an arclamp; for higher power applications, such as drilling or welding, the rod is usually pumped by repetitive pulses from a flashlamp. However, some continuously pumped high power systems have recently been developed. Nd:YAG rods are cut from larger crystals called “boules” which are produced in a furnace by the Czochralski growth method. As the crystal grows, it is pulled from a molten solution. The temperature of the melt, which is near 2000°C, must be precisely controlled for the entire 2 to 3 week duration of the process. Neodymium ions are substituted for a percentage of the Yttrium ions in the Yttrium Aluminum Garnet host crystal. The desired Nd percentage is typically around 1.0%. However, since the Neodymium ion is larger than the Yttrium ion, it only reluctantly fits into the Yttrium site in the crystal lattice. To force the substitution, the original melt must be approximately 5 times richer in Nd ions than the desired final rod dopant level. This forced substitution has a negative side effect. As the 1.0% doped boule is pulled from the 5.0% melt, the Nd concentration of the melt increases, similar to the way evaporation increases the concentration of a brine solution. The Nd substitution percentage increases as the melt concentration increases, yielding a boule with an axial or lengthwise dopant gradient. This limits the length to which uniform boules can be grown. In practice, this gradient is minimized by keeping the size of the boule small with respect to the mass of the melt. In this way, growth of the boule does not have as great an effect on the melt concentration. Varying the Nd dopant percentage will greatly affect laser output power and mode quality. Generally, lower dopant percentage will yield lower multimode output power, but improved fundamental mode (TEM00) quality. Low doped rods are preferred for applications such as thin film resistor trimming, when mode quality and small focused spot size are more important than maximum output power. Higher dopant percentage will yield higher multimode output power but poorer TEM00 mode quality. High doped rods are preferred for applications such as marking or engraving when maximum multimode output power i s important, and the beam is not apertured. Since the Neodymium ion is larger than the Yttrium ion, strain is induced in the crystalline lattice when Neodymium occupies an Yttrium site. This limits the dopant level which can be achieved while maintaining good optical quality. To ensure that Directed Light’s Nd:YAG rods are of the highest quality, a Twyman-Green interferometer photo of the boule is used as a cutting guide to select the best areas. Areas of excess strain are not used. In addition to inherent strain caused by the growing process, strain can be induced in the cutting and grinding process. Directed Light rods go through a unique strain relief process to eliminate these fabrication induced strains. The rod shaft surface has a ground finish for uniform, diffuse, optical pumping. The rod ends are ground to an extremely precise shape (l/10 or better), flat or radiused, parallel or wedged, and polished to a very high quality surface finish (10-5 or better). High damage threshold coatings are applied to the polished rod ends. In most cases, antireflective coatings are used to increase transmission efficiency. In some cases, highly reflective or partially reflective coatings are used to eliminate the need for a front or rear mirror. Although these coatings have very high damage thresholds, contamination by debris or moisture can cause coating deterioration. If this happens, the rod can usually be salvaged by repolishing and recoating at a fraction of the cost of a new rod.In operation, rods are usually mounted into a water flow tube arrangement for efficient cooling. Most rods can be purchased either mounted or unmounted for ease of handling and installation. In addition to YAG, Neodymium can be doped into glass. Glass has a few advantages over YAG: it is non-crystalline which makes it less expensive and crystalline strain issues do not apply so higher dopant levels can be achieved. Therefore, Nd: Glass rods can very efficiently produce high energy pulses. The main disadvantage to glass is its comparatively low heat dissipation capabilities. So, while Nd:Glass rods can produce high energy pulses, repetition rates must be kept low to keep the average power level down. This limits Nd: Glass to low frequency applications such as spot welding or drilling. For some applications, the output wavelength of Nd:YAG may not be optimum. Many other solid state lasing media have been studied and employed in scientific, military, medical, and communications applications. Erbium, Holmium, Chromium doped Sapphire (Ruby), Titanium doped Sapphire, and Alexandrite are just a few of the many available lasing media. However, for industrial materials processing, Nd:YAG and Nd:Glass are still the most practical and economical, optically pumped, solid state lasing media.